Do your employees know where to easily find your corporate social media policy and general posting guidelines? 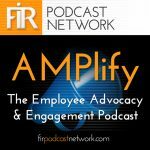 In this speech from the 2017 AMPlify event Jamie Laliberte Whalen, Sr. Manager of Content & Social Media at Mimecast, shares how you can make a social go card of your own, how to empower your company to empower themselves and how to make social fit at every level and department in your company. Connect with Jamie on Twitter @jamielaiberte or on LinkedIn.